Mortality is a scary thing. I’m not dying, but much of what I have written is. As of December 31, almost every book I have written for Discipleship Resources is going out of print. (The one exception is Vital Signs, but its days are numbered as well…) Part of my identity rests in the books I have written. They’re not great literature — some would say they’re not even “good” from any literary standpoint. Still, they are an outward and visible sign of my inward and spiritual journey, offering some of the best insights I have to offer on stewardship (Revolutionizing Christian Stewardship for the 21st Century, Beyond Money) and leadership (FaithQuest, A New Kind of Church, Equipped for Every Good Work, Leadership and Interaction Styles). It will be weird knowing that these books, many available for most of a decade or more, are no longer “out there.” For what good they have done and what value they have offered, I am deeply grateful. And when I am honest, I know that the contribution they have made has been modest at best, and there are more than enough other resources to take their places. But it is still hard. I guess I haven’t really admitted how proud I am of the books I have written. It is more than just ego that swells when someone recognizes me as the author of a book they read and enjoyed. Nothing makes me happier than finding someone who discovered real value in a book, helping them to be more effective in leadership. My writing has been an important part of my ministry, and there is something a little discouraging about seeing it going out of print. The two books I was working on last year — both having been approved by publishers, then pulled due to economic necessity — sit languishing, unfinished. They seem to me two precious children that nobody wants. Oh, well, I love them. And I know they have an audience, simply because whenever I talk about them, people want to know when they will “come out.” The problem is that my audience is so small that it can’t support what I write. Thank goodness for this blog. It has been my “literary” outlet for almost a year. Once again, I have no real sense of what difference it makes, but my writing isn’t just about who reads it and what they do with it. I find that I have a need to write, a hunger to share ideas, and a passion to stir things up. I write for my own enjoyment, then I get a kick out of sharing it with others — even when others disagree or get upset. Writing is a kind of open dialogue with the world. I love the give and take writing the blog affords. And so, I will continue to churn out my thoughts and hope someone, somewhere, finds value. Once, a few years ago, I saw someone in an airport reading one of my books. It was the biggest thrill in the world. But what made it even better was that, when I got closer to the person reading it, I saw it had been read a number of times, with pages marked, notes in the margins, highlighted passages, and random papers stuck here and there. It was not just read. It was USED. My books will hang around a few more years, then, like millions of others, they will disappear and be forgotten. I, too, insignificant when compared to my ideas, will be forgotten, but for a few wonderful years I have been able to add my thoughts to the discussion and stimulate some new thinking in other people. Like footprints in the sand, I made a brief impression, and with the waves of time the slate will be wiped clean that others might imprint in their own time and way. It’s been fun so far. It will be interesting to see where I will find my voice in the future. I will continue here, and see where I end up next. Dan — One of my seminary professors said that an author is only successfuly when his/her book(s) hit the out-of-print or sale table. Then people will buy and read them. Thanks for your efforts!! I love your writing…that is, what i’ve been exposed to. Faith Quest, Equipped for Every Good Work, and the Leadership & Interaction Styles as well as the blog have been nourishing and guiding for me as a young pastor. Keep writing! 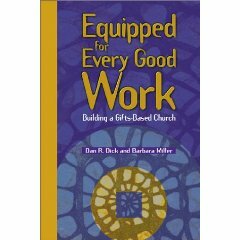 Just ordered two of these soon to be priceless gems from Cokesbury. I hope they are in stock.